Thanks - punchneedle This item is on sale. FROM STORE OVERSTOCK, NEVER USED, chart is in EXCELLENT condition. 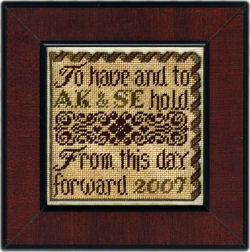 From Teresa Kogut, this punchneedle design comes with the design preprinted on weavers cloth. You supply the Weeks Dye Works (or DMC floss), 3-strand needle and 7" hoop. Works up to aprox 2.75" x 3.5". That Kind Of Stitcher This item is on sale. That's Halloween This item is on sale. FROM STORE OVERSTOCK, NEVER USED...From Alessandra Adelaide, a spider standing by a large pumpkin filled with the word Halloween. Stitched on 32 count fabric of your choice using DMC floss. Stitch count is 190w x 169h. The Birds and the Bees and the... This item is on sale. FROM STORE OVERSTOCK, NEVER USED...From Thistles, stitched on 28 count linen using Gentle Art Sampler Threads. Stitch count is 69 x 69. Theodore & Willie This item is on sale. FROM STORE OVERSTOCK, NEVER USED...From Mosey N Me, out of print chart is in EXCELLENT condition, with no markings of any kind and price sticker on front cover. Think Deeply - June This item is on sale. Think Happy Be Happy Row This item is on sale. FROM STORE OVERSTOCK, NEVER USED...From Bent Creek, stitched on 30 count Confederate Gray linen from Weeks Dye Works using Weeks Dye Works, Gentle Art Sampler Threads, and Classic Colorworks. Stitch count is 281 x 29. Happy Purple Heart Button is included. Think Of Me This item is on sale. Think Spring This item is on sale. FROM STORE OVERSTOCK, NEVER USED...From By The Bay Needleart, stitched on 28ct Waterlily linen using DMC floss and Weeks Dye Works Copper. Stitch count is 58 x 90. Thinking of You This item is on sale. This Day Forward This item is on sale. FROM STORE OVERSTOCK, NEVER USED...From Erica Michaels and her Petites Collection, this wedding sampler is simple and classic! The chart pack contains the 40ct Silk Gauze, full page charts with clear stitching instructions and tips. The stitch count is 77 x 75 and uses Gentle Art Flax & Old Hickory as well as Weeks Dye Works Havana & Rum Raisin - you could stitch this easily on any fabric of your choice! It's easy to stitch on silk gauze - you CAN do this! This Is...An Old Fashioned Feeling This item is on sale. From Annie Designs, published 1982. Out of print chart is in EXCELLENT condition, appears never used, with no markings of any kind and price sticker on front cover. Includes 14 designs.